After the golfers have played you have the option to post scorecards and print results. Tip: A quick way to see results on the main screen is to load in one of the “sample” results view. On the View menu click Custom Views. To see hole-by-hole results load the (Results-Hole by Hole) view. To see total results load the (Results-Current Round) view. These views are simply sample views, you can create any type of view you wish. See Custom Views for details. Select the player. Type the first few letters of the player's last name, player's ID#, or use the arrow keys. 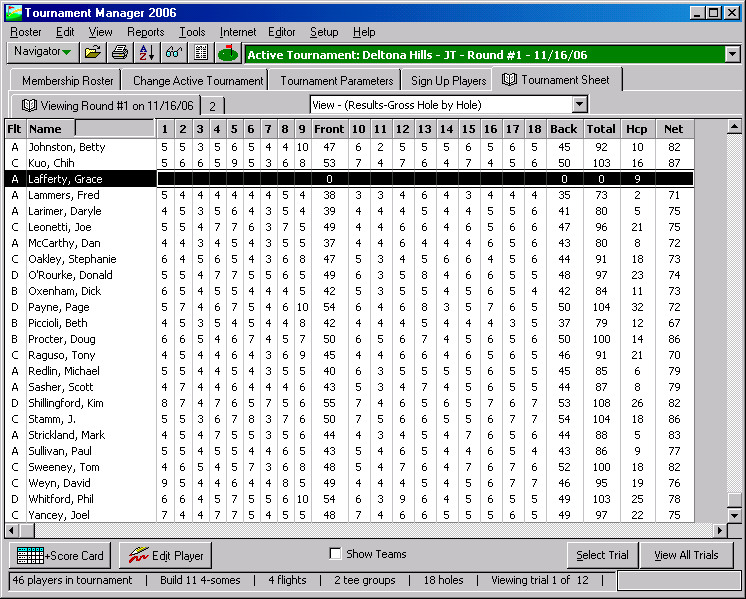 Press the '+' key, click the Score Card button, or right-click the player and select Edit player’s score card. The player's score card will appear. Enter the scores and press "+" or ESC to close the card. Scores can be entered hole by hole, or just total scores can be entered. To enter totals only, click the Tournament Parameters tab, click the Advanced Options tab and mark the option "Only total scores will be entered for results". If you choose to enter only total scores, all of the reports which rely on hole by hole information will be disabled.